Many older adults bring either a lifetime of experience or a new-found commitment to the well-being of the planet. Research shows that as “gray and green” volunteers help to address critical environmental issues, their own health and well-being improves. The green economy is a good fit for many skills that elders bring to later life. And service agencies for elders have a better chance to retain younger workers by going green. Be sure to capitalize on elders as resources in your community! Prepared for the Annie E. Casey Foundation. Catalogs policies and programs that engage elders in improving the lives of vulnerable children and families. Provides MORE concrete guidance to plan for the aging population during tight times in ways that benefit all generations. Based on the success of VFT #1 (below), this Toolkit includes 100+ additional strategies for communities to address health, housing, civic engagement, land use, transportation, community development, and more. It offers guidance about how to build from current initiatives and coalitions to forge a viable future for your changing and challenged community. This next age-wave will benefit from what’s been learned from previous planning for elders, and it will usher in innovations that both the boomer cohort and these challenging times require. VFT #2 can stand alone, or it can be used in conjunction with VFT #1. You might find the bundled Toolkits and their Training Guide to be your best bargain. Click here to read the Table of Contents. Provides concrete guidance for planning, policy-making, and programming to plan for an aging population in ways that benefit all generations. 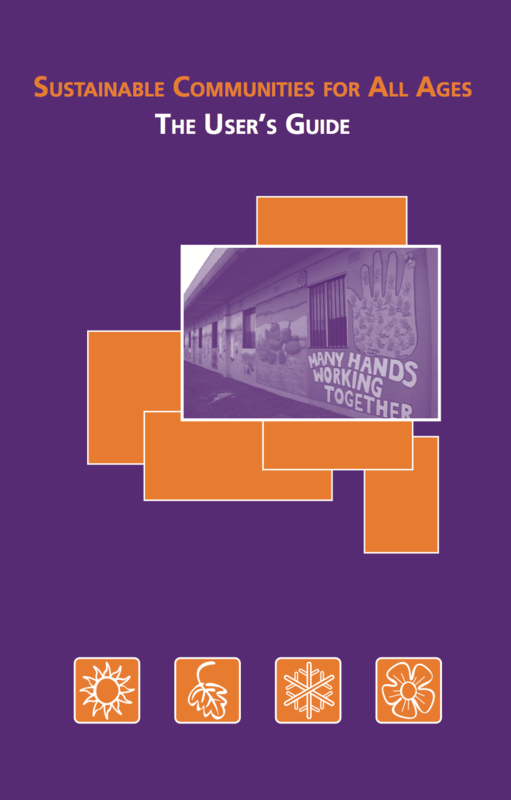 Toolkit includes a workbook; community checklist; issue briefs on health, housing, lifelong learning, land use, transportation, and more; tips for coalition building, a guide for resource development, user's guide, and DVD (18-minute video of 3 communities & PDF of the Toolkit). Click here for a list of organizations endorsing the Toolkit. This DVD contains an 18-minute video of 3 communities who used the toolkit to implement change in their communities. Also included is an electronic version of the Toolkit. Bring allies to the table! Gives you a systematic approach to help others understand the point of view of the Toolkits and how to use the resources in them most effectively in your own community. Click here to read the Preface and Table of Contents. Viable Futures Toolkits #1 and #2 plus Training Guide Bundle (Hardcopy) A great bargain! With BOTH the Viable Futures Toolkits #1 and #2, you get over 200 strategies for applying resources for aging in ways that can also address other community issues + tips and tools for coalition building, resource maximization and other key features of implementation. Plus, the Training Guide provides turnkey capacity-building agendas and materials so that you can enlist allies to build a viable future. Creating a Viable Future: A Case Study of the Jefferson Area Board for Aging, Charlottesville, VA. Documents how an Area Agency on Aging employs the point of view of the Viable Futures Toolkit to better the lives of children, youth, and families over the course of fulfilling its mission to serve elders in the community. Details how an Area Agency on Aging employs the point of view of the Viable Futures Toolkit to become more intentional in environmental preservation over the course of fulfilling its mission to serve elders in the community. Details on how an Area Agency on Aging advanced a viable local food system for its community. This guide provides an overview of local food involvement, including building partnerships, identifying strengths and weaknesses of your current food system, and moving forward successfully. Bring a “Garden to Table” approach to your organization! A companion to Charlottesville Case Study #3: Meal service providers can serve their clients healthy, locally grown produce while staying within their budgets. This DVD explains how to connect with farmers for fresh produce, plan for prep time,and more! It even provides weight-to-serving conversion tables. Help make the “Garden to Table” approach in your organization easier. A case study of the Arizona Community Foundation’s strategies that address multiple community needs through investments in work that builds communities for all ages. Shows how the New Columbia neighborhood used the Viable Futures Toolkit, step by step, to build a more cohesive community amidst a collection of new houses whose residents come from 22 different countries. Viable Futures Toolkit user’s guide. Reveals 12 key lessons that communities piloting the Toolkit and its point of view learned in the process of their work. This study allows you to learn from the steps of pioneers and hear about what they’d do differently next time. Based on national research among one million Boomers, this book by our Survey Research Partners provides a complete portrait of today's Boomers and intelligent ways to market to them. My Home for Life (MHFL) is a private-pay, subscription-based services program designed to help seniors live independently in their own homes. Proceeds from every sale on this site help older adults remain in their homes and communities as long as possible. From Bath Lifts to Jitterbug telephones, scooters and everything in between, we can deliver the right product to you. We are in business to help clients improve the quality of their lives, maintain their independence and preserve their dignity. Our dedicated staff is comprised of caring individuals who are experts in their field.